1 Asami Sudo, 2018 Miss SAKE, made a courtesy visit to the Ministry of Agriculture, Forestry and Fisheries, which has officially supported our activities as Miss SAKEs. 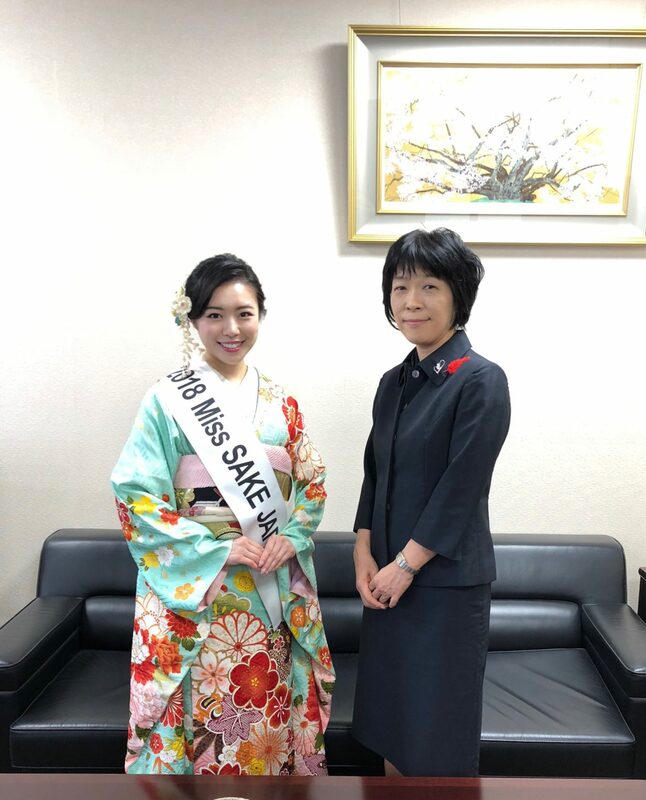 Asami Sudo, 2018 Miss SAKE, made a courtesy visit to the Ministry of Agriculture, Forestry and Fisheries, which has officially supported our activities as Miss SAKEs. 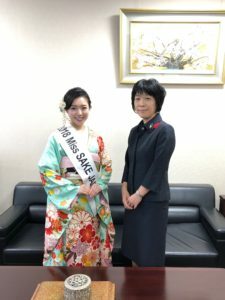 On October 2nd, I made a courtesy visit to the Ministry of Agriculture, Forestry and Fisheries, which has officially supported our activities as Miss SAKEs. This time, we had an opportunity to talk with Ms. Yutaka Arai, Director-General of Food Industry Affairs Bureau and Mr. Minoru Ono, Councillor and Deputy Director-General of Food Industry Affairs Bureau. The Ministry of Agriculture, Forestry and Fisheries is responsible for the development of agriculture, forestry and fisheries, the revitalization of farming, mountain and fishing villages and the establishment of stable and safe food supply. And the Food Industry Affairs Bureau is responsible for fostering and developing food-related industry. The “food-related” Industry includes affairs of SAKE, Japanese food, which was recognized by UNESCO as an intangible cultural heritage in 2013 and the producing regions of the products. The industry is one of the biggest ones in Japan, whose market size is said to be about 100 trillion yen. 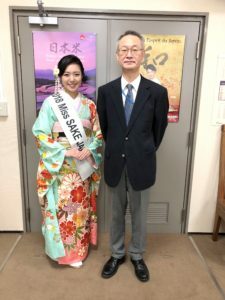 As you may know, the mission of Miss SAKE is sharing the greatness Japanese culture through SAKE. So, we have carried our activities, hoping to contribute to the development of the industry. 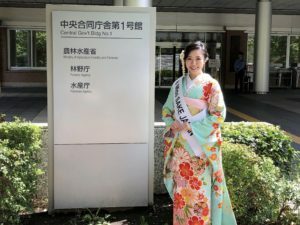 This time, I had an opportunity to report on this year’s Miss SAKE activities. From this March, I myself could visit 11 cities of 6 countries and join the promotion activities of SAKE and Japanese culture. It was an honor for me to have a chance to report our activities so far and have a lot of words of encouragement for our future activities. 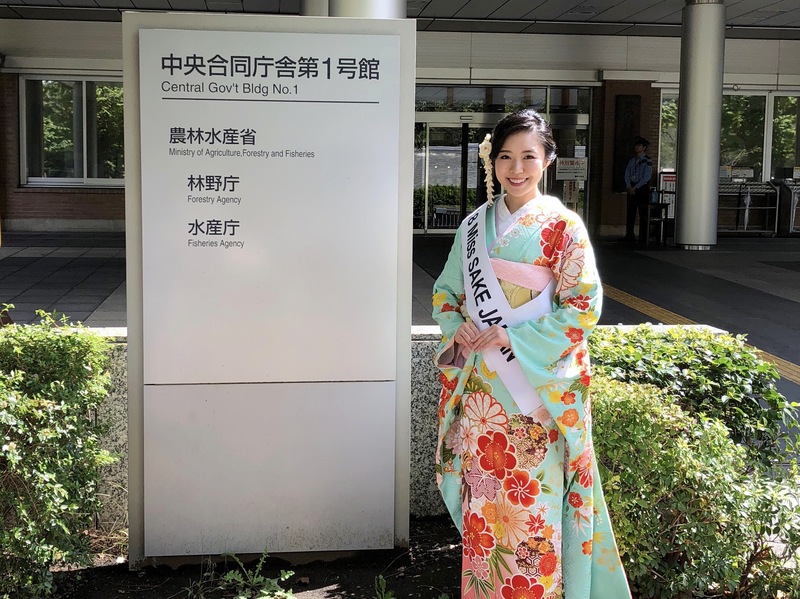 As goodwill ambassadors of SAKE and Japanese culture, we’ll continue to try our best to contribute to the development of the Japanese food-related industry. I extend my deep appreciation to Ms. Yutaka Arai, Director-General of Food Industry Affairs Bureau and Mr. Minoru Ono, Councillor and Deputy Director-General of Food Industry Affairs Bureau, for making a valuable time in their busy schedules.